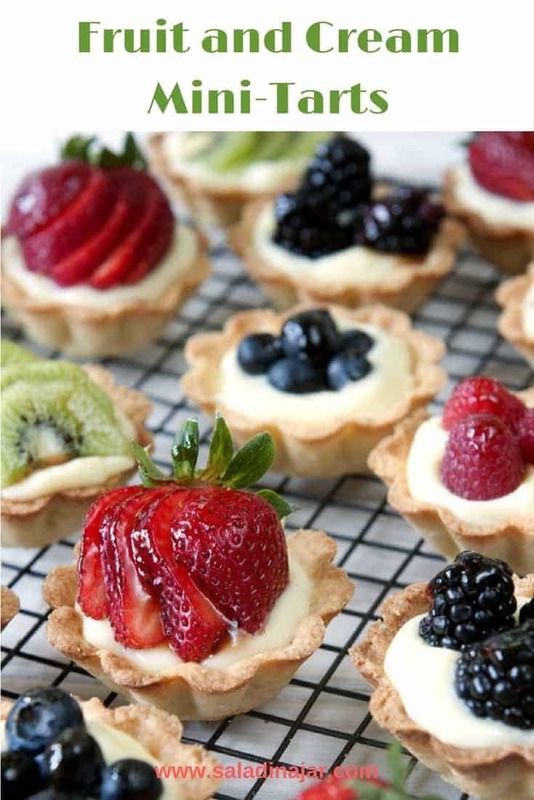 Fresh Fruit and Cream Mini-Tarts are shortbread-crusted miniature tarts filled with a light, creamy custard filling (made in the microwave), then topped with fresh fruit of your choice. They are easy to serve and easy to eat. Make your next celebration memorable with this gorgeous dessert. We’re back! We’ve been out of the country and now we’re in recovery mode. While I’m putting together a few of my favorite food shots from the Holy Lands, I’m sharing some easy, fresh fruit mini-tarts we served at a wedding shower recently. You might notice this is one more way to dress up cream pie filling–an obsession with me here lately. It’s just so easy with a microwave! Make them easy with this recipe for the shortbread crust. Molds available from Amazon. A few people have reported some difficulties with the crust, so I went back to my favorite cookie crust recipe. I like the texture better and hope you do, too. Nevertheless, these mini-crusts are still somewhat tedious and not recommended for people who have never made a pie crust. Store-bought, pre-baked mini crusts are readily available and highly recommended if you are a novice baker or trying to make these in quantity. You can make the crusts ahead of time. The raw dough pressed into the molds will keep in the freezer for over a month. Planning ahead will give you plenty of time to practice and build your confidence. Grease and flour your molds generously. If you use silicone molds like the ones shown in this post, you won’t have to worry about this. Otherwise, Baker’s Secret is perfect for the job. Freezing the tart crusts before you bake them is ABSOLUTELY ESSENTIAL. Otherwise, they will shrink and melt the minute they hit the oven. Place foil inside crusts before baking. Press the foil down against the crust. 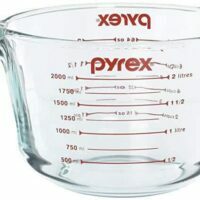 This will keep crusts from rising up in the middle while they bake. No other weight is necessary. Save the used foil if you want to. It’s reusable with your next batch of crusts. Turn the crusts out of the pan within 3-4 minutes after coming out of the oven. 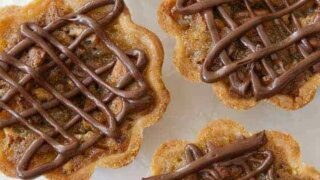 I have included this picture from my post about Chocolate Ganache Mini-Tarts to illustrate the process of making the tart crusts. Never mind that the dough is chocolate in these pictures. The process is the same. 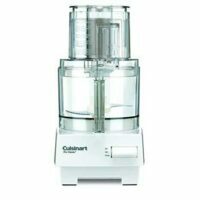 Combine flour, sugar and salt in food processor. Cut butter into 8 slices and add to flour, pulsing several times until mixture resembles oatmeal. Add egg yolk mixed with cream. Pulse until all ingredients are moistened. Then allow machine to run a few seconds until dough starts to stick together. (Add additional drops of cream if dough seems too dry.) Press dough into a roll like refrigerated cookie dough. Wrap in plastic and chill 30 minutes. Slice roll of dough into 12 pieces. 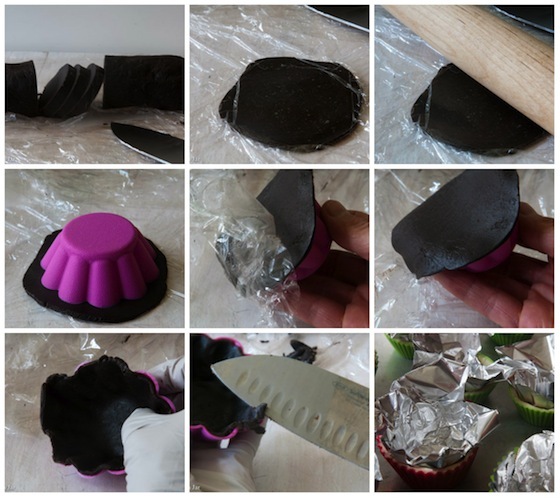 Using a rolling pin, roll dough between two pieces of plastic wrap into a circle slightly larger than tart molds. Press into mold with fingers being careful to keep thickness consistent. Use a knife to trim off any extra at the top. I usually have enough scraps to make another tart or two. Freeze for at least 30 minutes, overnight or up to a month. Place frozen tart shells on cookie sheet and press a small square of foil down into each crust that molds to shape of crust. See picture above. Bake at 400 degrees for 10 minutes. Remove foil and continue to bake until golden brown, usually about 3-4 minutes. Fill each baked tart shell with cream filling. Top with fruit of your choice. Melt 1/4 cup currant jelly and use a brush to dab some shininess on each piece of fruit. It's OK if some drips onto the cream. 1. If dough in food processor seems too dry to press into a ball, add a teaspoon or two of milk or cream. 2. Tarts are best eaten the day they are assembled. 3. A dollop of whip cream makes these even better. Chocolate Ganache Mini-Tarts are either chocolate or vanilla crust mini-tarts, filled with a decadent but easy bittersweet chocolate ganache. A no-bake filling makes these two-bite cheesecake mini-tarts easy to make ahead of time. Browned butter provides the base for this pecan-lover's dream dessert. 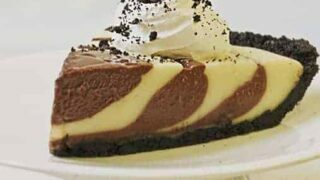 Please share an eggless version for the cream filling. Thanks ? Nice to hear from you. I have never experimented with eggless custard. So I don’t any of those kinds of recipes. These are absolutely delicious! Everything turned out beautifully and everyone loved them! I have to make more for my mother. She is crazy over them. I just served them with a little sliced banana and Hershey’s chocolate syrup. I am anxious to try other fruits. The recipe looked tasty, so I tried it. Can not get the cream filling to thicken. I noticed the same comment from Emily back in Dec 2011, no reply. By chance can you think of what may be going wrong? Beautiful but too much work. Hi. I tried making this recipe and the only problem I had was with the instructions for the custard filling. I followed the instructions and measurements just how it was written and my custard didn’t thicken at all in the microwave. I even microwaved it a few minutes longer and still nothing happened. It was very upsetting as it was planned for a dessert that day and it never hardened in the fridge. After following the instructions, I looked back at the pictures and saw that custard was really thick and the instructions never explained how to make the custard thick. Very disappointed. I am so sorry about your custard. I am have made this recipe many, many times with great success as have others. My only guess is that perhaps your microwave is not very powerful and it needed to be cooked much longer or that you left out the cornstarch. Also, the pudding does get much thicker as it cools. Again, my regrets. Made your recipe for a graduation party yesterday. It was outstanding. I am amaze how easy it was to make the filling in the microwave. No risk of scorching or constant stir like traditional method. This will definitely be my go to recipe from now on. Thanks! I am soooo not a baker but I found your cream recipe so easy to follow and delicious! Will be using it again and again. Thankful I found your website! I’m making these cute mini fruit tart for a school event and the cream came out a little weird. Its yellow and very thick. Is the cream suppose to be a light beige, similar to the picture? Is there a way for me to make it more smooth? What can I replace the heavy cream with? You might try using the whole egg instead of just the yolk. I don’t think the tarts are quite as tender when substituting egg white for heavy cream, but they are still quite wonderful and perhaps a little more sturdy. when we fill tart with cream ,cream must be cold or hot? , after filling how many hour can stay? please reaply me thank u!! I made the big one the crust was perfect but I have changed the filling. I really liked it because it was my first time and it was ok. The custard recipe included with these fruit and cream mini-tarts is wonderful, in my opinion. I have found nothing better or easier. I’m not sure I understand what you did. After you bake the tarts, you should take them out of the molds to cool. They become very crisp like a shortbread cookie. If you leave them in the molds, the moisture put off while cooling and the moisture from the cream filling would most likely make the crust soft. These tarts are best the day they are made. Hi Paula your fruit tart looks good. I’ve made this tart, but at the end of the day the fruits looks wilted. How do I make it look fresh all day? I’m sorry I don’t really have a good answer other than to use the freshest fruits possible and don’t wash them until minutes before you put them on the tart or just wiping them is even better. That’s why I wrote in the recipe that the fruit is best added just before serving. It’s the nature of the beast. The melted jelly helps them look fresher too but I assume you did that already. I tried these and the chocolate cases with ganache and they were an absolute hit!!! Thanks a million for the recipe .. I was able to prepare them in advance as in freezing the shells etc so not much work on then assembly day! So glad to hear they were a hit! Thanks for writing. Using the silicone you mention, what is the thickness of the crust that I should make? Hmmm. Good question. All I can say is that I get about 14-15 individual tart crusts from one recipe. They aren’t very thick but have not actually measured them. Hey, I liked the recipe very much. But there is a problem I’m pure Vegetarian. Can I try this recipe without the eggs. Would there be a major difference in the taste or not. Please guide me. Oh dear. I am not vegetarian and I LOVE eggs so I can’t be trusted to give you advice. I would think there is a major difference without eggs. Seems like the pudding would be like sweet gravy. But surely there are recipes for vanilla pie filling/pudding on the web you could Google. Hey there, this recipe looks great! I’m looking to make these for mother’s day and I just have one question.. 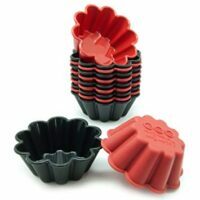 If I don’t have the shaped baking molds like that, can I just use a mini muffin tin and press the dough into it instead? I can’t honestly say I’ve tried the mini-muffin pans. Thinking that is a bit too small. Perhaps better to use regular muffin pans. The crusts will shrink a bit. Be sure you spray them well with Bakers Joy or something similar. Also, be sure unbaked crusts are frozen hard when you put them in the oven. I have tart dough in the refrigerator now and was looking for a great filling– I have found it here– thanks! Also, it’s my good luck that I have the same molds from World Market and I appreciate your photos showing how to fill them with dough. I hope mine turn out nearly as pretty as yours. I am wondering if you have instructions anywhere to make the cream on the stovetop. We don’t use a microwave for health reasons, but these sound amazing! Let me know if you do! Thanks! O M G these were so amazing and so easy to make. I just had a little trouble finding the molds but right when I was ready to give up I found them…..you were right the molds make it much easier. They are so good I even put little marshamellow’s in before I put the cream I made these for our church’s breakfast everyone loved them and are asking for more thank you so much. It will get much thicker when it is chilled but I suspect you need to microwave it a little longer. It should coat a spoon rather heavily, just like it would if you cooked it on top of the stove. Microwave ovens vary greatly, so it is difficult to specify an exact time to cook. Also, it can thicken in a matter of 10 seconds so watch it closely as it cooks until you know exactly how long it will take in your specific oven. Can I make the filling over stovetop since I need to make a large quantity? 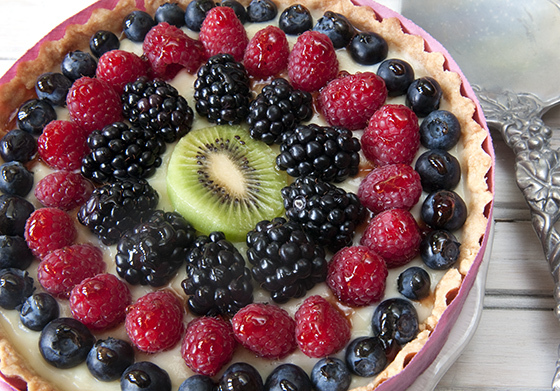 Your fruit tarts are very beautiful. I love to see them very much. Thank you very much for your wonderful recipe. I will try to do as your instruction once day and i hope the fruit tarts that i make by myself will very delicious and good looking like yours. Thank you and wish you much more famous on the world. Hi Paula, these tarts look amazing! Fruit tarts are one of my favorite desserts, so I had to try them. However, the cream filling never set for me. It was runny as milk. I followed your directions exactly. Any idea why this may have happened? I’m making these tarts for Thanksgiving for my boyfriends family, I am making them the day before. Will they still be good tomorrow? Any tips for how to keep them longer? hi , thank you for replying… i had trouble with transporting the filled tarts, and some said the tart were not cold ,like some store bought tarts have that cooled taste. do u have to keep it in the fridge before serving? Yes, I would keep the tarts chilled as much as possible. Transporting them can be a challenge. Maybe use a big ice chest. Regarding the thickness of the tarts: this is something you will figure out with experience. 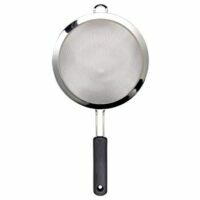 It is very hard for me to advise you since I don’t know the size of the pans you are using. If you make them too thin, they will tend to break so you have to experiment with the specific tart pans you are using. The more you make them, the easier it will be. Thanks for writing and letting me know how they turned out. I recommend assembling the same day you want to eat it. Then store in the fridge. It won’t hurt for them to sit out a little while during transit or on a serving table. If you need to do all the work ahead of time, make the crusts and the filling. Store separately. The day of the party, put the filling in the crusts, then the fruit on top. If the filling sits in the crust too long, the crust will soften but that takes anywhere between 12-24 hours. Hope this helps. Write back if you still have questions. I honestly have no idea. Guess you can try it. The ingredients aren’t very expensive so no big loss if you have to throw it out. You said that pre-made crusts work great for this recipe–which brands do you recommend (and which grocery stores carry them)? I can’t seem to find them anywhere! Kay, I’ve seen them at my local Krogers and also at Central Market. Sorry I can’t recommend a particular brand. I always make my own. Help, I just made the cream and it’s not thick at all. Is it suppose to be thickening at all after the 6 minutes in the microwave or does it start to thicken after? And if it only thickens after, do I cool it in the refrigerator or room temperature? Hi Paula! 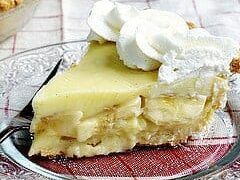 thanks for sharing such a wonerfull recipe I have a question If I want to make a whole tart instead of small tarts am i supposed to use same ingrediants? Hi! I just made these tarts, and everything worked beautifully. I followed your instructions to the T. I am so pleased with my delicious little desserts! Thanks for coming back to say so. Glad you enjoyed them. I used all nonfat milk, and the cream never thickened. Any ideas? Hi, I was following this recipe step by step and it did not turn out at all. I have baked a lot before so, for the most part i know what im doing. 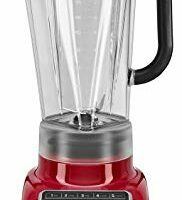 I dont have a food processor nor do i have any means of getting one so i tried both my mixer and blender and still nothing worked well. They look amazing in the pictures but the recipe just did not work out. Jessica, Tell me more. Was it the crust or the filling that did not work? What exactly was not like you expected? What did you try to make in the mixer? I hardly know where to start but would love to help you. The tarts could be made by hand and you can use a whisk for the cream filling if you don’t have a blender. If you only had trouble with the crust, you might look for some ready-made ones. The homemade shells are somewhat labor-intensive, but the taste is worth the trouble. Look forward to hearing from you. Saw these on Pinterest, fruit tarts are my favorite! They turned out so good, thanks for the recipe! Glad to hear it Michelle! Also, do you ever stab the crusts with a fork? Would that keep them from puffing? I don’t stab the crusts although if it works for you, do it. If they are puffing, I just open the oven door and use my thumb to push them down. And thank-you so much for the link. Glad you liked them. I couldn’t agree more about the cream filling. Thanks for the tip on freezing the crust before baking. I will this next time. Also could I use this tart crust recipe to flatten, cut out with a cookie cutter, and then put it into a muffin tin? What does 1-1/2 cup mean? does it mean 1 cup to 1/2 cup or 1 and a half cups? Im still sort of a baking noob. thanks for such an accurate recipe n simple too! best tarts ever!! !my family just licked all the leftover cream filling !! !i know i ll have to make these more often now…. Hi Sim, Yep, the cream filling is the best part. It’s just pudding really, but oh so good! I just made these and the custard is amazing. I used skim milk and was doubtful that it would thicken but it absolutely did. Wow. 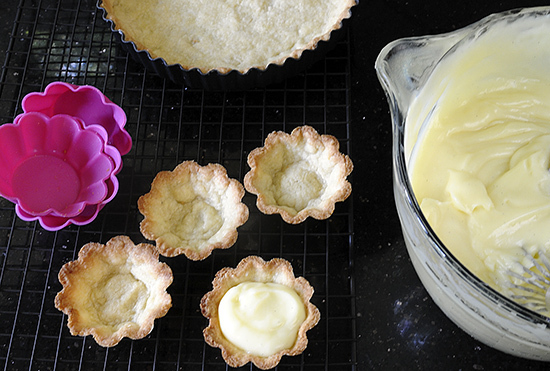 Now, if I had only waited until the custard was cool before trying to fill the mini tarts…. So glad they turned out for you. I will add a note to the recipe. Happy mother’s day. I took your suggestion and used a whole egg and they turned out very good. The filling is amazing. Thank you so much for the recipe, they are delicious. I’m bringing these for the mother’s day gathering tonight. I have the same problem as Adeline. I made the mini fruit tarts, but the crust just fell apart. I was able to get a few good ones, but when I put fruits in, the strawberry slices are a bit heavy and broke the edge too. Is there anything I can change to make the crust more firm? THanks. Cherry, I am so sorry to hear this. It sounds like the edges may be too thin and therefore, too delicate. You could also try using the whole egg instead of just the yolk to make the crust a little more sturdy. Hi Paula. I tried making your tarts for my mom’s Mother’s Day dessert, but the tarts just crumble and fall apart whenever I pull them out of the molds! I don’t know what I’m doing wrong. Can you help? Could you tell me what size your tart molds are? We don’t have a World Market near here and they are not on their website. There are so many sizes of molds I wanted to make sure I got as close to yours as possible. Thanks! I am making these for supper club tomorrow and was wondering if I can make the shells and the filling ahead of time? would I just cover the shells with foil overnight? would i put saran wrap over the cream and refrigerate overnight? If I let the cream stay in the fridge all night, I was wondering how I will fill the shells tomorrow, because won’t it be a lot thicker once it gets cold? Yes, you can make it all ahead of time, just don’t assemble until and hour or two before eating. You can store the shells in an airtight container, like cookies. And yes, Saran wrap over the cream will work fine. Yes the cream gets thicker but no problem. 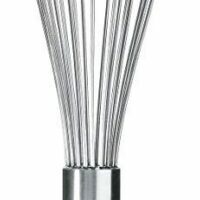 Just use a whisk and whip it up good and it will loosen up. Great recipe for the cream filling! It was so easy and turned out perfect in the microwave. I’m never going to slave over a stove for pastry cream again. One note for those that didn’t get it to set up – I had to microwave mine for 7 minutes instead of 6 before it thickened. How many mini tarts does this recipe make? I tried making the Cream Filling. I did everything it says on the directions, but my filling ends up liquid filling instead of thick filling like yours. What am I doing wrong? I stummbled upon your blog….and i’m speechless !! I love these tarts !!! I haven’t seen anything better looking and inviting than these !!! They are simply DELISH !!! I love your food photographs…..why don’t you share some food photography lessons to your blog !! Would love to take some lessons from you. So, my missionary farewell is this Sunday. I am expecting 300+ for brunch. I am doing every bit of it myself since it is Sunday, I can’t hire anyone. Just finished making the pastry cream for the tarts. So delightful and easy. I am hoping it is okay to keep it chilled in the fridge until I fill the shells. I have a box of premade pidi shells from a company in New York. I plan on filling them with your pastry cream and decorating them with the fruit and jelly like you said to. I need to make these the night before, and hope they will hold up, as our church meeting is at 8:30 A.M. and we will be eating about 11:00. I will let you know how they turned out. Thanks for your wonderful recipes!!!!!!! I will def try these out at home! These tarts are the perfect way to serve all of the beautiful fruit that’s in season right now. Your little pink tart molds are adorable too! 🙂 Can’t wait to hear about your trip! Beautiful and the technique of making pastry cream in the microwave is a novel idea for me! Will try it one of these days! 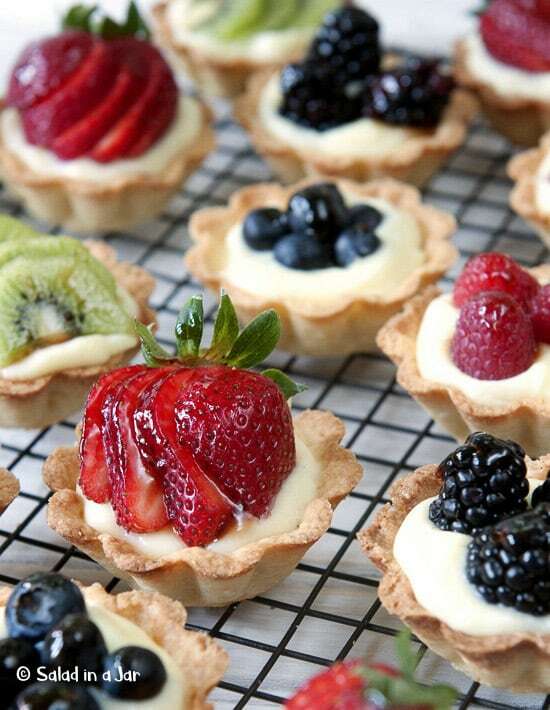 These tarts look so beautiful. You arranged the fruit perfectly. Your photographs made me very hungry! Welcome home….we missed you! So glad you were able to visit the Holy Lands. We toured Israel in March of 2006 and it was breathtaking and overwhelming to see. Many goosebump moments. Thank you for sharing through your blog…I enjoy your insights, photos and recipes. Beautiful! Glad you arrived back safe and sound. These photographs are mouth-watering! Saw your little tarts on FG and just wanted to pop in to say how cute they are. They are adorable and that filling looks really yummy. Oh my goodness don’t these look fab? Yum! 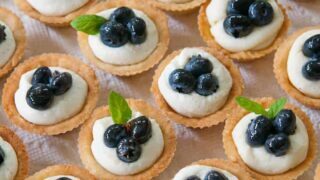 I’m making some mini tarts for a wedding I’m doing in November and I’ll be remembering this recipe! I know I’m making chocolate and pumpkin but I might I have to add a vanilla too! Your little tart crusts look perfext! I love the mini pies, they are so cute. I can’t wait to hear about your trip. Hi Paula! Welcome home! Love these tarts, so pretty and being the shortbread lover that I am, I think I could eat at least 4 or 5 of these in one sitting! 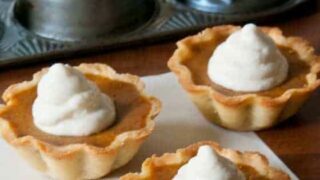 Thanks for the tip about where to get the tart shells, so cute! Gorgeous! I love to serve ‘little bites’ for dessert, and these are perfect. Love the use of seasonal berries, too. Oh dear…major impulse to bite the screen! So beautiful Paula, and yet simple too. Thanks for sharing these. And just when I think your pictures of food can’t get any better, you make these beauties!!! Welcome back! These look so delicious, Paula. I adore the mini-pink molds. Have a great holiday weekend! These are gorgeous! I want to eat one right now. So festive for the upcoming holiday weekend. Beautiful! 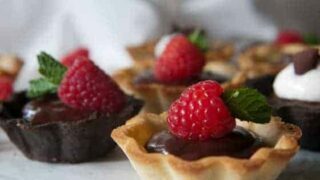 The little tarts looks amazingly delicious and your photo is over the top gorgeous! Such clarity!